Watching your favorite movie on DVD. Surfing the web. Scanning barcodes at the grocery store. Since 1960, lasers have revolutionized the way we live. Through a series of events and programs in 2010, LaserFest helped to showcase the prominence of the laser in today's world. Browse around to learn all about the science, applications, history and people associated with one of the greatest inventions of the 20th century! Adaptive Optics utilize powerful lasers to create an artificial "star" 100km above Earth's surface, which scientists use to correct telescopes for atmospheric distortion. 1961: Charles Campbell and Charles Koester destroy a retinal tumor with the ruby laser, the first medical use of the laser. Curious about the answers to our new posters? Click on the poster to find out more. Surprise! We chose two grand prize winners that will receive $1000 each. We also have a People's Choice Award winner. The closing date for applications for the Innovation Award Laser Technology provided with 10.000 Euro prize money is January 17, 2014. This European research and technology prize is awarded at 2-yearly intervals jointly by the associations Arbeitskreis Lasertechnik e.V. and the European Laser Institute ELI and addresses individual researchers or on entire project groups, who have successfully conceived and implemented an innovative idea relating to laser technology, following the project through from application oriented research to ultimate industrial application. We present you with SpectraSound, the device that uses laser modulation to send your music across the dance floor... or all the way to NGC 5194. 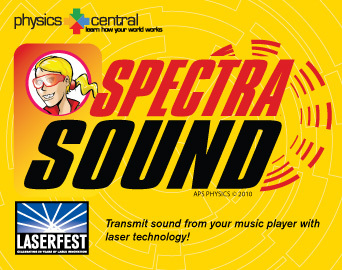 SpectraSound is perfect for the home, classroom, lab and parties! We're selling this kit as part of LaserFest, the 50th anniversary of the laser. With mirrors, you will be able to send your music anywhere! Use your hand or a comb to create scratches like a real laser DJ. Find out how to get your hands and ears on your own SpectraSound kit. The 2012 Nobel Prize in Physics has been awarded to two physicists that devised laser-based techniques to explore quantum mechanical behavior of photons and particles. Serge Haroche of the Collège de France and David Wineland of the National Institute of Standards and Technology share the prize. Learn more about the prize here. LaserFest rewarded 38 outstanding outreach teams up to $10,000 to educate and celebrate the 50th anniversary of the laser. Follow them around the world! Writer Jeff Hecht moderates a panel of laser dignitaries at the MIT Museum.